This is becoming a habit. Here is another page of the Azeroth’s Farmer’s Almanac. This guide is for mining farmers and prospectors. I made a note for you re-salers out there, too. Mining is the core of the most lucrative AH business in Azeroth, so I hit it from all angles just for you. Heh. I sure hope Dugi don’t mind me spamming up his Blog board! First, this should not be hard to find. Everyone will have a different route for you to follow and here’s mine. 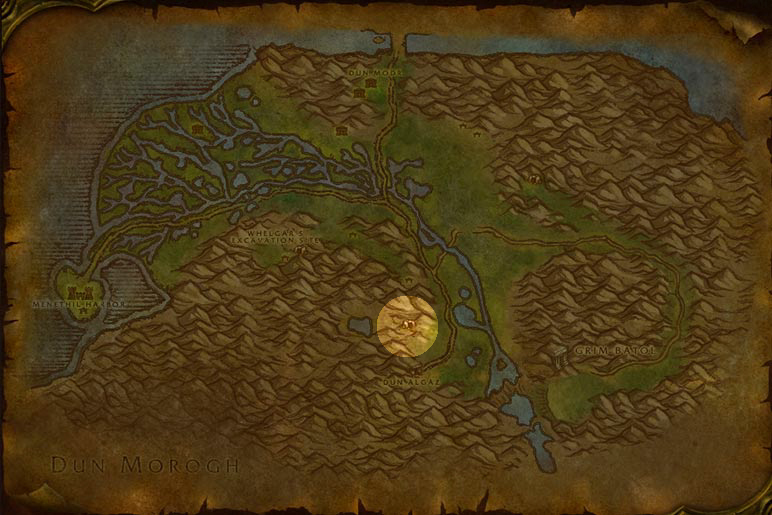 While Dun Morogh has been more ideal with it’s many peaks and nodes, I prefer the human lands. The route is quick and will take you into a popular cave with many nodes. Respawn rate for these nodes are 2 to 4 minutes (depending if you are inside or out) and a mailbox is along the way for easy drop off. 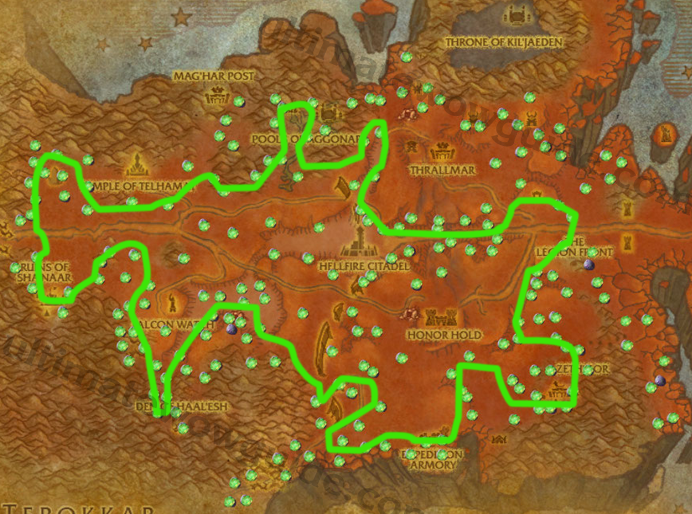 On the horde side, you have Dugi’s original routes which still holds true. Take a trip through 1000 Needles and stick to the walls. Yes, you will deviate every once and a while, but try to stay to the walls. 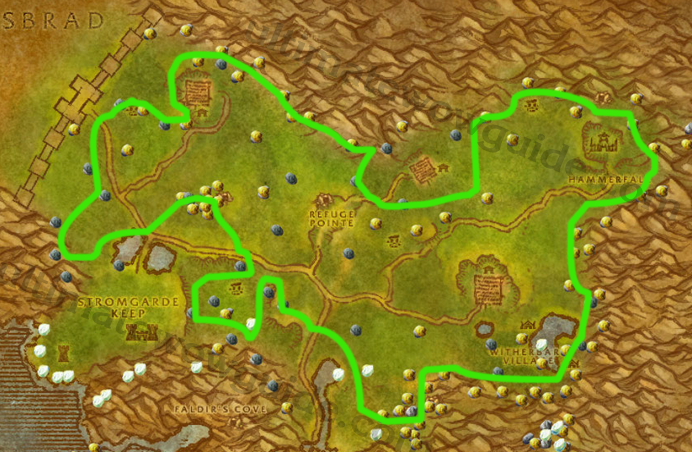 For the Horde, there’s a town right smack in the middle of the route. For low level Alliance, stay away from that town — the guards are hungry. Marked on the map is a flight point that you can use to unload if you are full. Tip: Sell the silver ore in stacks of 7 for maximum efficiently. This is ore that is need for Ally players only. If you are a horde, you can either destroy it or ***** Market to yourself to sell on the other side. 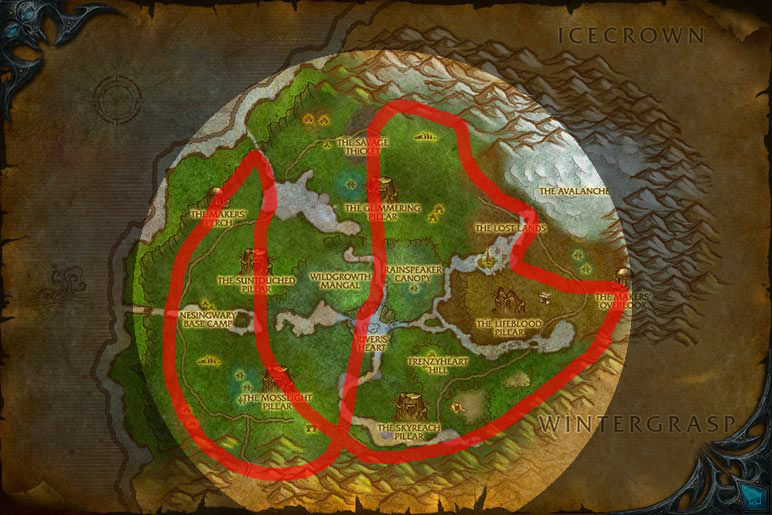 You’ll need to head to the caves shown in the map below. This area is also a great place for Silver and Tin due to quick respawns. TIP: This cave only has so many nodes of Silver and Tin in it. Work your way to the back of the cave and log out. Farm with a different toon in the 1000 Needles for 1 route. Log back into your first toon. Work your way back out, and then repeat. There are a few places that are more accurate than Dugi’s original route, but Dugi’s is the best. Just keep in mind of Hammerfall if you are Ally; go South around Hammerfall instead of North. Don’t forget to check the caves. For the simple routes, go to the Blasted Lands or the Searing Gorge and hug the walls, but take a trip into the Slag Pits once and a while, too. 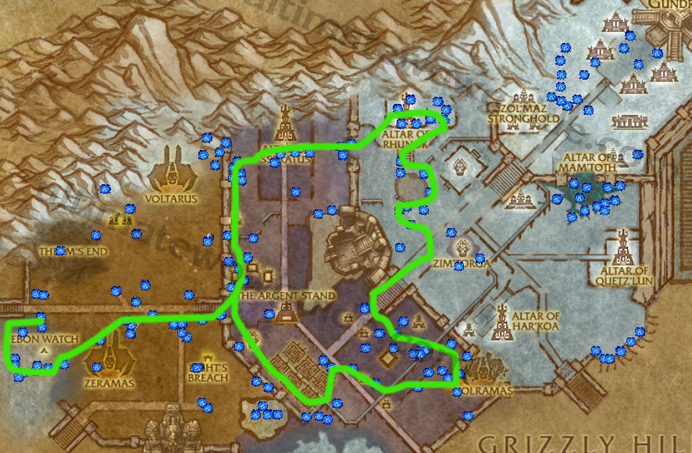 Dugi’s route is easy to do to (show below), but keep in mind anything north of the river; If you can’t hack through random mobs of level 60 elites (and a dragon), keep clear. If you are on the other continent, break out your swimming gear and farm the underwater ruins in Desolace’s Ranzajar Isle. Go to the Un’goro Crater and hug the walls. Dive into the Slithering Scar for the Rich veins and do a quick circuit around the Fire Plume Ridge. 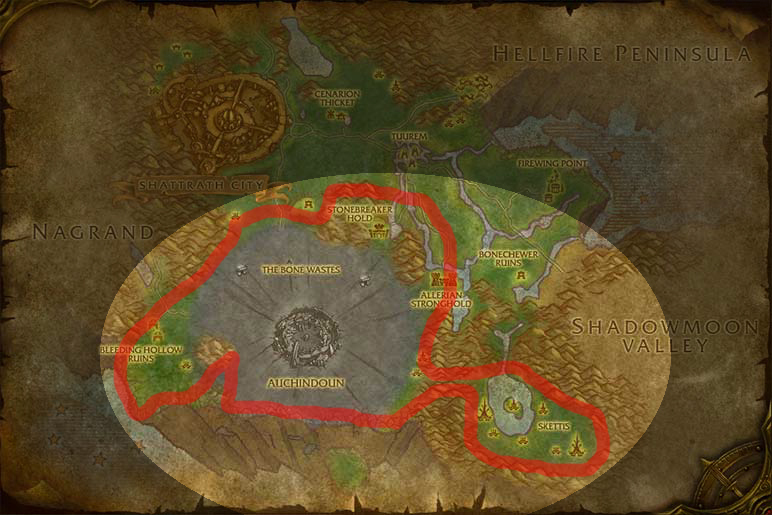 If this area is too populated with farmers, then head next door to Silithus and raid the hives; don’t do laps there because it will just waste your time. Yes, the bugs are skinnable. 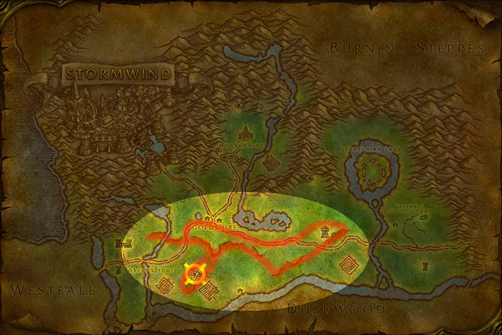 The most direct farm is to mine the **** out of the Molten Core, but as an instance, there is no respawn nodes. 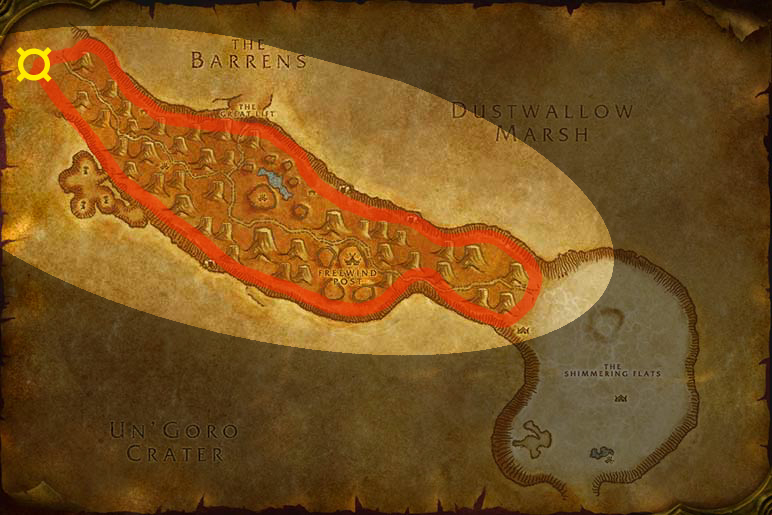 However, if you wonder through the Slag Pits of Searing Gorge, then you can find nodes here, too, and you can also farm for Dark Iron Scraps from the Dwarves in this area. Tip: Sell Dark Iron Scrap on the Ally AH in groups of 30 for maxium profit. Unfortunately, Dugi already has the best route. My only suggestion is that you acquire an epic flying mount to increase flight speed because that’s a looooooong route. Dugi, again, has the best route. 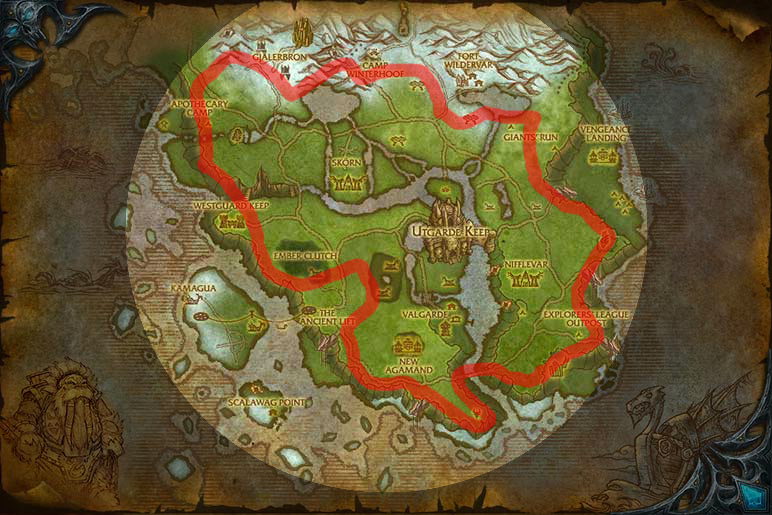 Nagrand has the highest amount of nodes over all the other outland nodes. 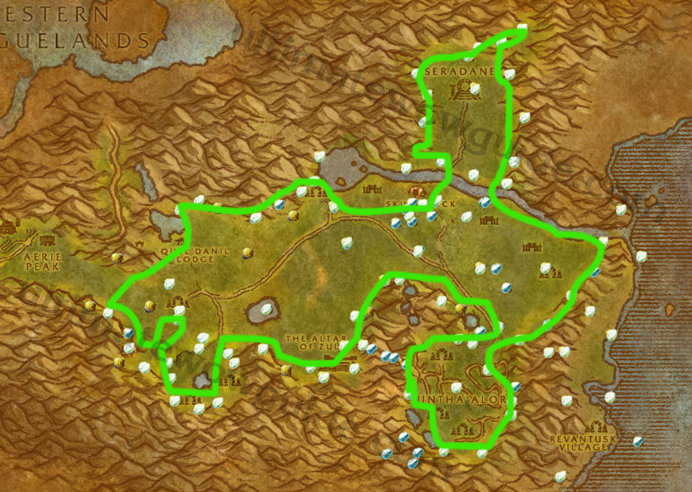 If this area become too populated, you can fly along the route below in the Terokkar Forest. 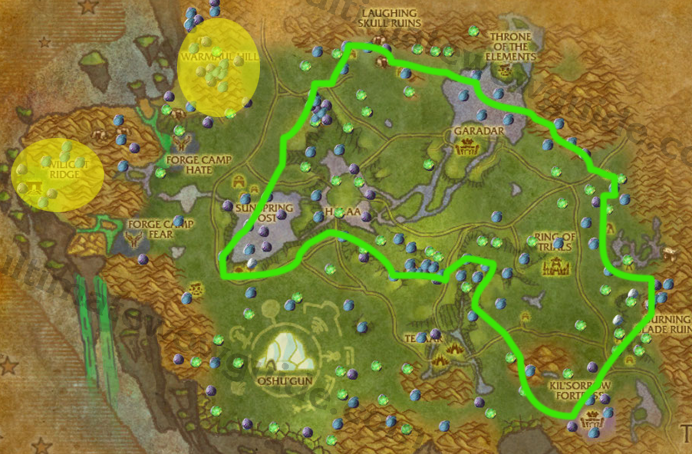 Since this is a smaler route, having an epic mount is not as required. See the Nagrand Map Above. This is a rare ore that only has a small percent chance of a node appearing. Basically, mine everything you see and you will have that small chance to see it pop up. Keep an eye out for it while farming in Outland. Head over to Shadow Moon Valley’s Netherwing’s Ledge and have at it. You’ll need a flying mount, of course, and this ore is needed for a quest line, so don’t expect a quick sell. If you are a skinner, there are many great mobs for you here as well. Tip: You can mine this ore to 450. 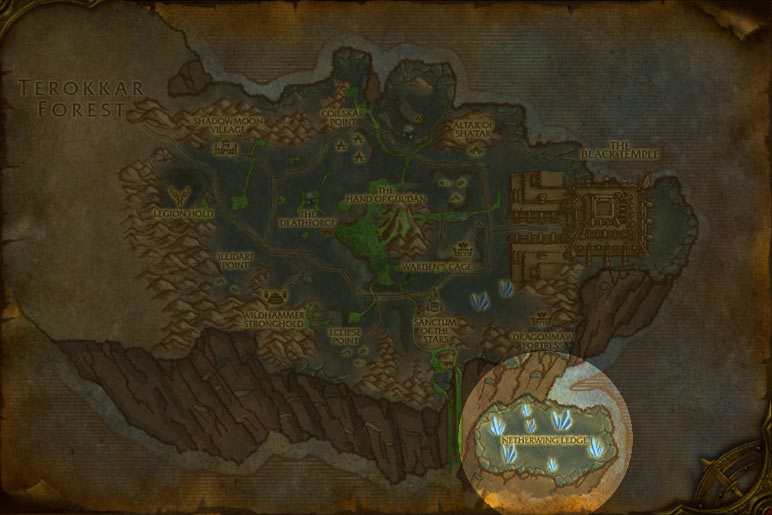 While the Dugi Map below is a great source for cobalt ore, some players might want to try to farm as soon as they get to Northrend. The map I provide is for lower level farmers. Wintersgrap is a great location for mining both Saronite ore and Titanium Ore, but if your fraction is not up to snuff, you might not have access to it. As an alternative, farm the Sholazar Basin below. While it might not seem like the best map, this route hits the main hot spots rather effectively. Titanium is a rare random replacement for Saronite. This is the top end so everyone is looking for it. For the best farming results, do not attempt to farm during peak hours. Have a fast flying mount and fly low (but not low enough to arrgo). Since it is both rare and random, don’t try farming in areas that you’ve previously hit; the odds are against you. If everyone is flying close to the walls in search, then stay in small tight circles in the center. * Tip: This is a High End Item. Cream of the crop. Gems tend to fluctuate greatly between 20-30 GP plus or minus (per item). Ore will fluctuate depending if your fraction is in control of Wintersgasp (10-50 GP per 20 stack). Servers will vary.